PHILADELPHIA (AP) -- The Democratic National Convention gets underway in Philadelphia on Monday with much bigger demonstrations than the Republican convention and much higher temperatures, as the region copes with an oppressive heat wave. In one of the largest rallies planned for the day, a pro-Bernie Sanders group is expected to walk across the Ben Franklin Bridge, which connects Camden, New Jersey, and Philadelphia. The demonstrations, largely driven by Sanders supporters, have been peaceful, so far. On Sunday, throngs of people marched along a main thoroughfare of the city to show their support for Sanders and their disdain for Hillary Clinton. They chanted "Hell No, DNC, we won't vote for Hillary" and "This is what democracy looks like." Though planned for months, the marches came as fractures appeared in the party that had been trying to display a show of unity in recent weeks. Debbie Wasserman Schultz resigned Sunday as Democratic Party chair over an email suggesting the DNC had played favorites for Clinton during the primary. The Democrats had been trying to avoid the divide that was apparent in Cleveland during the Republican National Convention last week. But the hacked emails, published by Wikileaks, further fired up Sanders supporters, who long accused the party of favoring Clinton despite officially being neutral. Sanders had called for Wasserman Schultz's resignation, and said Sunday night she made the right decision for the party's future by resigning. Darcy Samek, 54, traveled alone from Minneapolis to protest through the four-day convention. She said Wasserman Schultz has been a "miserable failure" who needed to be gone. "Everyone kind of knew (the Democratic party was against Bernie Sanders), but that doesn't mean it will change now that it's proven. It's just more of the same," she said. Philadelphia police called Sunday's protests, peaceful, and said they were pleased with how things were going, so far. 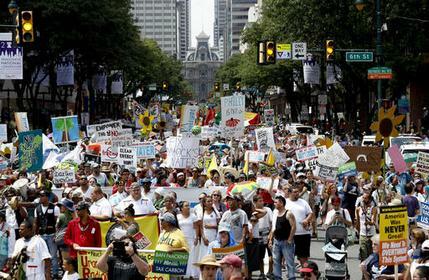 Earlier in the day, thousands of clean energy activists jammed a downtown street in their mile-long march from City Hall to Independence Hall, near the Liberty Bell. They held anti-fracking and anti-pipeline signs, some with illustrations like a train surrounded by a fireball and the words "No Exploding Trains." Others held "Bernie or Bust" signs. Sam Miller, 82, traveled from Erie, Pennsylvania, to join the march that stretched several blocks and across a wide street as temperatures in the city soared into the mid-90s. He said he was inspired because "fracking is invading Mother Earth." The heat wave is not going away anytime soon. It will hit a peak on Monday with temperatures in the city possibly reaching 100 degrees, but feeling like 108, according to the National Weather Service. Officials said volunteers will be handing out water to demonstrators all week. Some of the largest protests will start about 4 miles north of the Wells Fargo Center in south Philadelphia, where the convention is being held. Most protests during the RNC were concentrated in a tight, 1.7-square mile zone downtown. A heavy police presence and fewer than expected protesters helped keep the calm. There were only about two dozen arrests and no significant injuries. More than 5,000 delegates are among the 50,000 people set to attend the four-day convention, which is expected to culminate with Clinton being named the party's official nominee for president. 0 Response to "DNC STARTS IN PHILADELPHIA WITH HUGE PROTESTS, HIGH TEMPS"